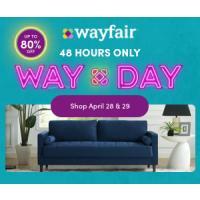 Wayfair is your online destination for home furnishings and décor, offering over 8 million products across furnishings, décor, home improvement, housewares and more. Beyond our extensive selection of original looks across ever style and budget, we provide superior customer service and the convenience of online shopping, making it easier than ever to live in a home you love. Sign up and receive promo code for an extra 10% off. You must click on this offer to get the savings.